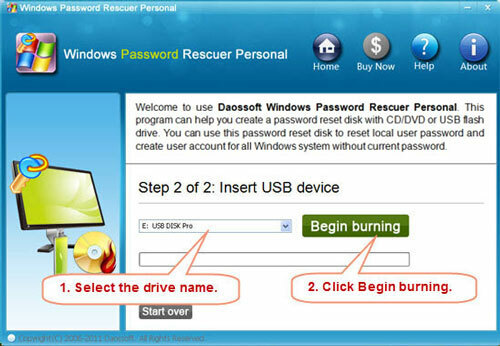 Recover Lost Password for Windows, Office, RAR, ZIP, PDF, SQL etc. Are you using Windows 7 and unfortunately forgot administrator password? This problem always makes people annoyed for it won't let you download anything or enter any data without admin account. If I forgot my Windows 7 admin password, what should I do? As some people said, there are some ways can be used to reset a forgotten Windows 7 password, such as a repair CD, a password reset disk, using command line etc. However, these methods have some limitations. Repair CD and reset disk must be created before forgetting password, using cmd requires a admin account privileges. This article will show you another perfectly way when you forgot Windows 7 login password and have no reset disk. Windows Password Rescuer Personal, which is designed for Windows password recovery and suitable for Windows 7 starter, home basic, home premium, enterprise and ultimate users especially any other Windows OS such as Windows 10/8.1/8/Vista/XP, Windows 2000/NT etc. Step 1 . Download and install Windows Password Rescuer Personal on any computer you have access to. This step is easy to everyone. But note that it just can be installed on Windows 10/8.1/8/7/Vista/XP and Windows server 2019/2016/2012/2008/2003/2000. In a word, you can create a Windows password recovery disk with the software on any computer installed Windows OS. Now purchase Windows Password Rescuer Personal then you will receive the full download link. All process is secure and automatically. Step 2 . 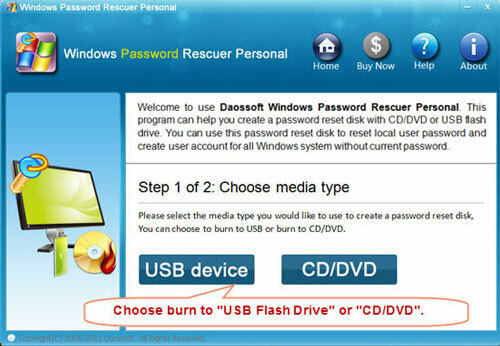 Burn Windows password rescuer to CD/DVD/USB. 1 . Open Windows Password Rescuer program. Choose a device to burn to. 2 . Click "Burn" button to start burning. Burning successfully completed, click OK. Step 3 . Reset forgotten Windows password or create new account without login. Insert the CD/DVD or USB Flash Drive and reboot your locked computer. Change the PC's setting to boot from the CD/DVD or USB. 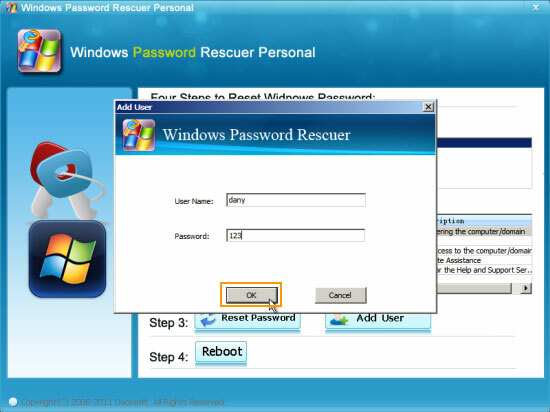 And you'll see the interface of Windows Password Rescuer. When you forgot Windows 7 password, a better choice is directly clear the password. 1. Click a user account such as administrator from list , then click "Reset password" and then click "Yes". 2. 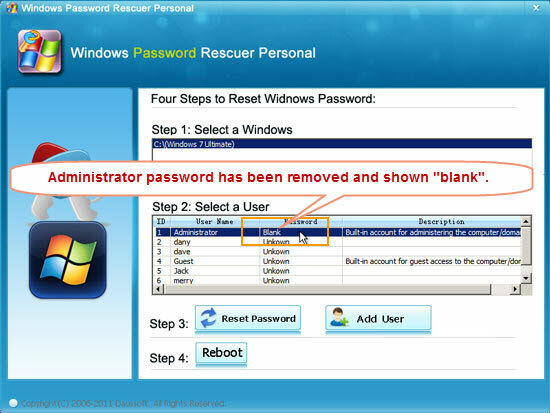 Windows 7 administrator password will be successfully erased instantly. Now you can click "Reboot" to restart your computer and login Windows 7 without any password. Another choice, you can create another admin account to regain access to your computer that you forgot login password. 1. Simply click "Add new user". Then type in a user name and password, click "OK". 2. The new account will be created instantly and displayed in the list. Click "Reboot" to restart your computer and login Windows 7 with the new username and password.